On The Block: Is The Phnom Penh Post Going 金边邮报? Just two months after Malaysian business entrepreneur Sivakumar S Ganapathy (aka Siva Kumar G) purchased The Phnom Penh Post from Australian mining magnate Bill Clough (See: New Era For The Phnom Penh Post Under Malaysian PR Company Ownership) the future of Cambodia’s oldest newspaper is again under a cloud. Cambodia has exported over 80,000 tons of rubber within the first six months of 2018, amounted to $120 million of revenue, according to the official report of the General Department of Rubber, Ministry of Agriculture, Forestry and Fisheries on Saturday. National Election Committee has received 11,000 ballot boxes and 40 pick-up vehicles from Japan to serve election, worth of $7 million, according to NEC’s press release dated on Saturday. Phnom Penh’s administration earlier this year proudly announced the opening of the city’s first-ever airport railway link to make travel to and from the city more convenient. The National Bank of Cambodia (NBC) said in its mid-year report the country’s real economic growth will average seven percent this year, with strong contribution from the agricultural, industrial and services sectors. Coca-Cola on Friday launched a new product in Cambodia, the Coca Cola Plus Coffee, after its successful launch in three other countries, namely Japan, Australia and Vietnam. In the first half 2018, the local financial sector continued the strong growth that has characterised the industry in recent times, with commercial banks and microfinance institutions (MFIs) seeing a robust expansion in loans and deposits, according to the National Bank of Cambodia’s (NBC) semi-annual report released on Saturday. Cambodia on Sunday celebrated the 10th anniversary of the inclusion of the Preah Vihear Temple and the first anniversary of the inclusion of Sambor Prei Kuk archeological site on the UNESCO’s prestigious World Heritage List. 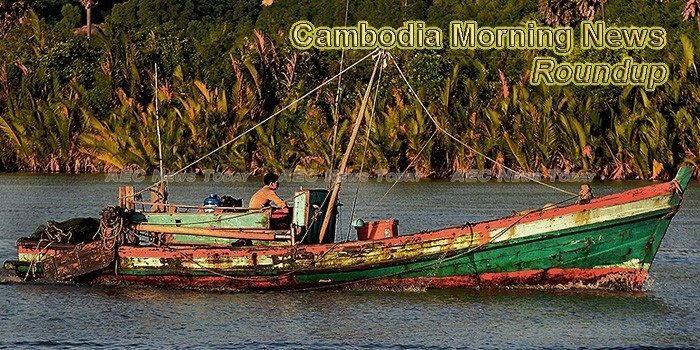 Cambodia used up to 1.8 million hectares out of 2.5 millions of arable land in 2018, an equivalent of 73% of the total arable area, according to the report of the Ministry of Agriculture, Forestry and Fisheries Fresh News received on Saturday. Cambodia’s foreign policy strategy has been chiefly shaped and driven by “economic pragmatism,” meaning the alignment of foreign policy with economic development interests, in which there are two main approaches: transforming the international environment into a source of national development and diversifying strategic partnerships based on the calculation of economic interests. The Cambodian People’s Party (CPP) and the National Police have dismissed complaints by Human Rights Watch (HRW) that high-ranking members of the armed forces campaigned for it before and during the election period – a violation of the Cambodian constitution. Eight franchises of Century 21 Cambodia received awards for their performance in the local market from the parent company, Century 21 Real Estate LLC, a real estate agent franchise company headquartered in the US. Ride-hailing services seem to have grown into a dominant player in the capital’s transportation sector. Cambodia’s security forces are “actively campaigning” for the ruling party of Prime Minister Hun Sen ahead of a general election on July 29, in violation of a law requiring political neutrality, Human Rights Watch said on Thursday. At least two people deceased and 48 others were sick after consuming alcohol on Friday night at a funeral held in Snoul district, Kratie province. Former Cambodia National Rescue Party (CNRP) president Sam Rainsy failed to appear in court on Thursday to answer charges of insulting King Norodom Sihamoni. The Kamchay Hydroelectric Company has alerted the public and relevant authorities in Kampot province to take extra precautions for possible flooding. With the national election just around the corner, Japanese Ambassador to Cambodia Hidehisa Horinouchi sat down with Khmer Times’ executive editor May Titthara to discuss his country’s continued support of the Kingdom as others cut aid in the wake of the CNRP’s dissolution, as well as further strengthening of socio-economic foundations to help the nation reach its goal of becoming an upper-middle income country by 2030.